Director, Division of Plastic and Reconstructive Surgery. Victor I. Rosenberg, M.D., F.A.C.S., has been a Diplomate of the American Board of Plastic Surgery since 1969, after having completed four years of training in General Surgery followed by three more years of training in Plastic Surgery. All seven years were spent in Mount Sinai, Beth Israel and Albert Einstein, all New York City hospitals. During the Viet Nam War, he was a Commander in the United States Navy, serving as Chief of Plastic Surgery at the St. Albans Naval Hospital. Dr. Rosenberg is the inventor of instruments used in Plastic Surgery and other surgical specialties. He has authored papers which were published in medical journals. Dr. Rosenberg, whose specialty is Cosmetic and Complex Reconstructive Surgery of the entire body, has been in private practice since 1970. 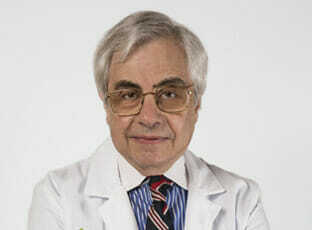 For twenty years he was the director of Plastic Surgery at NYU Downtown Hospital. In addition, he has enjoyed a long time affiliation with Beth Israel Medical Center and The Mount Sinai Medical Center and for many years has been on the staff of Mount Sinai School of Medicine. In 1998, he received the honor of Alumnus of The Year at NYU Downtown Hospital. We are privileged to have his experience, knowledge and expertise at NYC Surgical Associates. An active member of numerous prestigious professional organizations, Dr. Rosenberg’s list includes the American Society for Aesthetic Plastic Surgery, the American College of Surgeons, the International College of Surgeons, the American Society of Plastic Surgeons and the Society of Military Plastic Surgeons. Dr. Rosenberg has been featured on many TV shows. Amongst them are ‘Oprah Winfrey,’ ‘Donahue,’ ‘Maury Provich,’ ‘Joan Rivers,’ ‘Live with Regis and Kathy Lee,’ ‘Mike Douglas’ and on many national and local news shows. His numerous radio appearances include ‘Sally Jessy Raphael.’ He has been interviewed in numerous newspapers and magazines, including The New York Times, New York Post, Daily News, The New York Times Magazine, Harper’s Bazaar, Vogue, Allure, Cosmopolitan, US, Self and Ladies Home Journal. His disarming, kind and sincere bedside manner as well as expansive clinical knowledge make him a valuable resource to our surgical staff.